The Association of Science-Technology Centers (ASTC) is a global organization that provides a collective voice to science centers, museums and related institutions, such as the Patricia and Phillip Frost Museum of Science. Each year, nearly 2,000 individuals representing these institutions gather for ASTC’s annual conference. This year’s conference was hosted by the Montreal Science Centre in Montreal, Canada’s second-largest city and one of sixty-nine in UNESCO’s Creative Cities Network, on October 17-20. In an effort to increase our exposure, as we get closer to our opening, Frost Science was thoroughly present, despite the low temperatures. It even snowed one morning! Our President and CEO, Ms. Gillian Thomas, led a party including Dr. Eldredge Bermingham, CSO; Jennifer Santer, Vice President of Content Development and Programs; Ms. Alexandra Kuechenberg, Mr. Fernando Bretos, and myself from the new museum team; and Ms. Cheryl Juarez and Ms. Isabel Leeder from our education team. I was lucky enough to attend a series of pre-conference sessions as a 2015 ASTC Fellow, and arrived to Montreal on Wednesday, October 14. The conference itself did not kick off until Saturday, a few hot chocolates later, and it did it in style. 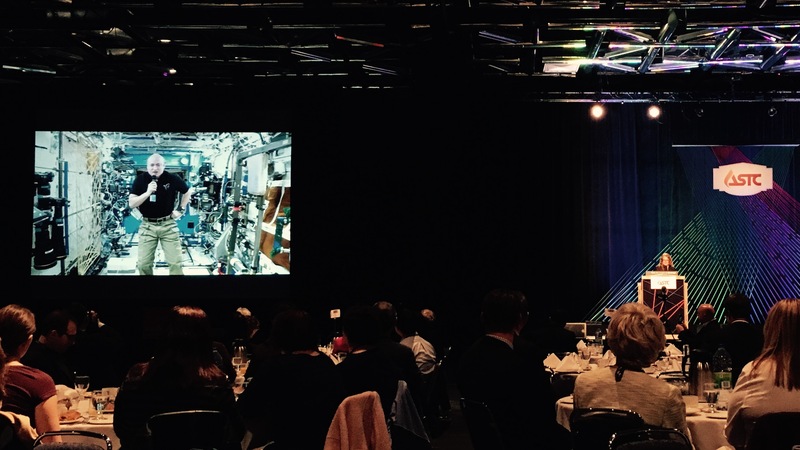 Astronaut Scott Kelly welcomed all participants from the International Space Station, and Dr. Annick Desjardins talked about treating cancer with polio, and the challenges of science communication when done right. The Frost Science team led and participated in sessions about many different topics. Jennifer and Gillian led a session about accessibility which grappled with the concept of it and took on the challenge of reframing inclusion, exploring the role that museums can play in modeling accessible design principles to ensure that our buildings, exhibits, and programs are not only accessible but inviting and enriching for everyone. They also presented in a session about science centers in Africa, which is emerging as a fresh frontier for science education, as new science centers and innovative science education programs are being formed and strengthened. Finally, Jennifer presented also in a session about future cities, and the roles that science centers and museums might play in helping to enable that the cities in which they reside are more livable for more people. Ms. Alexandra Kuechenberg, Mr. Paul Orselli and I during our session. Alexandra and I led a session about how the success of a science center is partially rooted in how well it reflects the community that hosts it. Paul Orselli from POW! joined us in our effort. We, of course, did it in costume as Snow White, the Evil Queen, and the Magic Mirror. Cheryl and Isabel led a session about our CHISPA project, a national collaboration working together to build stronger communities and increase the engagement of Hispanic children and their families with science and local science resources. Finally, Fernando presented a poster about our Museum Volunteers for the Environment (MUVE) project and citizen science. The conference was certainly a success for our team, and we were able to cultivate both new and old connections that will prove invaluable as we finalize the development of our exhibitions, planetarium, innovation center, and aquarium. Stay tuned! On a more personal note, one thing stood out, and that is my experience as a 2015 ASTC Fellow. I am forever thankful for the group of people I got to share this experience with, including other fellows, alumni, and facilitators. I certainly was not ready for such a genuine and honest adventure driven by our shared stories and experiences, and our ability to embrace them. We cannot wait for next year’s conference, just up the road in Tampa, hosted by our colleagues at the Museum of Science & Industry, where we will be be able to unveil to everyone the wonders of our new museum.